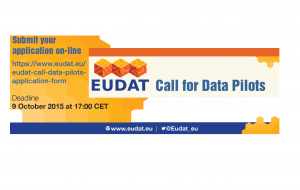 There are just 4 days left to apply for the EUDAT Data Pilot call. An exceptional opportunity to present your tailor made integration request for EUDAT services in terms of data synchronisation and exchange, data repository & sharing, data replication and preservation, data staging for analysis and processing, data discovery and search, data typing and visualisation and even proposals for new services or tools in big data analytics or semantic web. Who can apply? The call is open to all European initiatives, infrastructures and research communities. EUDAT services target a broad range of disciplines, in particular those looking for simple solutions to store and/or perform computations with research data, or for a robust data infrastructure to manage, access use, re-use and preserve their data. Pilots can avail of EUDAT data storage from the start of the pilot, free of charge, and up to 5PB in total at one, or several, of the 13 EUDAT sites. EUDAT will promote and disseminate the data pilots to a broad range of stakeholders offering considerable visibility opportunities. Solutions building on general research data management approaches such as proposed by the Research Data Alliance (RDA) will be favourably viewed. EUDAT will match all effort with a corresponding amount (1 PM Pilot Team = 1 PM EUDAT).